Anyone with any affinity for jazz cannot visit New Orleans without at least one evening of music. I recently organized a jazz night for fellow visitors at Snug Harbor, the city’s premiere venue for national as well as famed local performers. Ellis Marsalis, patriarch of the First Family of Jazz, plays nearly every Friday night at Snug. Other great performers with Big Easy connections are often on the bandstand of the small, acoustically perfect club—the younger generation of Marsalises, Astral Project, Donald Harrison, Nicholas Payton, Dr. John. But we selected Saturday night and were introduced to Afro-Peruvian jazz through young trumpeter Gabriel Alegria and his amazing sextet. Traveling to New Orleans to hear Afro-Peruvian music seems incongruous until you think about the origins of jazz in Crescent City at the turn of the 20th century. Where did jazz come from? From African slaves mixing it up with the indigenous Creoles who themselves were cultural hybrids. Parallel to the musical jambalaya of the Delta was the somewhat earlier collaboration on the west coast of Peru of African slaves, indigenous Indians and the European upper class, leading to the growth of a celebratory music that shared some of the joy and blues of American jazz while developing its own unique rhythms –not the son and meringue or salsa beats to the north, but very different, complex rhythms of festejo and lando. While Peruvian folk traditions have enjoyed renewed interest in the past decade or more, most of what we hear these days are the flutes and drums of Andean origin. Gabriel Alegria, who grew up in the privileged class of Lima, has studied the Afro-Peruvian music and culture of his country’s central coast while also seriously studying American jazz through programs at the University of Southern California and CUNY. Over the past few years he has developed a unique blend that is truly hemispheric, sounds as diverse as Gershwin and Miles Davis layered over the beats of lando and festejo. At Snug Harbor, his sextet was equally mesmerizing whether playing “Summertime” and “So Near, So Far” or any of Alegria’s original compositions inspired by childhood memories and special locales. Expecting to hear the clavé, the rhythmic core of much Latin music, I was unable to find the beat, finally realizing that there was no clavé but instead a more complex, forceful polyrhythm, trumpet or flugelhorn conversing with bass, guitar, percussion. Freddy “Huevito” Lobaton was nearly a one-man show himself, perched on the cajon (a hollow box) and beating it into submission with the flair of a master conguero. Young Leandrea Leguia sang through the tenor sax with incredible grace and assertiveness, while leader Alegria most often picked up the flugelhorn, which he alternately squealed with a fluttering hand mute and evoked pure majesty with a burnished vibrato. Snug Harbor is an ideal setting for an intimate encounter with any music. The adjacent restaurant serves excellent (and quite reasonable) New Orleans cuisine from garlicky broiled shrimp to rich etouffé; the bar effectively separates dining from listening; the club itself is quite small such that there isn’t a bad seat in the house. Six of us squeezed into one far corner where we had great sightlines and unobstructed sound, particularly suited to observing the interplay among all combinations and most enjoyably a duel that evolved between percussionist Huevito and Alegria’s new bassist, Ramon de Bruyn, on the first set closing tune, “Buscando a Huevito.” Our only regret was that Huevito did not play the traditional quijada—a real jawbone from a rather large animal―during the first set. A few days before I left for New Orleans, I heard from pianist Geoffrey Keezer about his new project (“Aurea”) through Artists Share. Keezer, known as Art Blakey’s last pianist (when he was a mere 18) and subsequently a purveyor of inventive post bop, typically in trio settings, has been composing and recording with a new, larger ensemble of culturally diverse musicians in celebration of—Afro Peruvian music. It’s not Geoffrey’s first foray into global folk traditions, having recorded with a Hawaiian slack key guitarist and recently with Okinawan folk artists. And among his many musicians, he shares one in common with Gabriel Alegria—drummer Hugo Alcazar, who is serving as percussion master in tandem with Keezer’s regular drummer, American Jon Wikan. And you don’t have to be an acclaimed jazz pianist or master of the cajon to appreciate the sonic energy and complementary rhythms of coastal Peru. You might just be a visitor wandering through the French Quarter, not far from where jazz was born as an amalgam of African and New World musics, stumbling upon a parallel universe where African traditions endured in and revitalized another New World culture, to be uncovered and transformed through modern jazz language by the likes of Gabriel Alegria and Geoffrey Keezer. 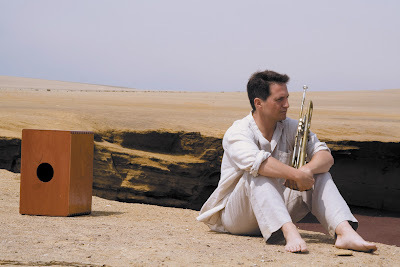 You can listen now to Gabriel Alegria and his sextet on Nuevo Mundo (2007, Saponegro). Visit www.geoffreykeezer.com to link to Geoffrey's project site on Artists Share.